We are committed to adhere to established accessibility standards and to protect the content of this Site, including material owned by us and those provided by affiliated companies or licensors. Online course access is automatically granted to all registered learners. CELN will not ship any material to learner as all courses are offered online only. 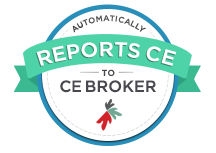 We are committed to making CE Learning Network web site accessible to all users, regardless of special need. The site is designed to be compatible with screen readers and other assistive devices. However, this is an ongoing process and it is possible that some users may encounter problems accessing some pages.